San Francisco is the home of cioppino, but Chicago's Burhops has the best recipe. As I mentioned in an earlier post, I went to San Francisco recently and it was a real soupalooza experience. Everywhere I turned there was soup … including a few places that specialized in nothing but soup! Of course, you can’t go to the “city by the bay” without sampling cioppino, a fish stew that originated in the North Beach section of San Francisco. The story goes it was made by the fisherman right on the boat. They would chop up the catch of the day and turn it into soup. Talk about fresh! Ironically, my favorite recipe for cioppino comes from Burhops, a fantastic fish purveyor in Chicago. I used to make this all the time, but I stopped when I almost killed my then three-year-old niece one Christmas Eve. Turns out she is allergic to shrimp but no one knew it at the time. I thought I was serving poissons (french for fish). It turns out it was poison for my niece! A trip to the emergency room with a toddler who looks like a blow fish will ruin your taste for a good recipe, even a good soup recipe. Still, I highly recommend this one. Just make sure you are not allergic to shell fish. And don’t worry about following the recipe to the letter. If you don’t like something or it is too expensive, just leave it out or feel free to substitute. Mix all herbs and separate into two parts. Sauté vegetables until tender. Add canned tomatoes, clam juice, and half of herbs. Let simmer 30 minutes. Taste and salt if necessary. Add seafood and remaining spices cook 5-10 minutes and serve. 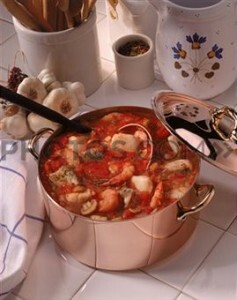 This entry was posted in fish and tagged cioppino, San Francisco, seafood by soupbabe. Bookmark the permalink.